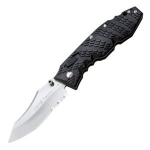 The SOG Flashback mini is in my opinion a great looking knife. It feels great to hold and is a nice weight as well as a comfortable size. The knife balance is good with the blade and handle weighing the same which adds to the overall great feel when the blade is in hand. The blade deployment is very fast and relatively easy to open once it has been used a couple of times and with the ambidextrous thumb studs is is made more accessible. Straight out of the box however the blade can be slightly stiff. When the blade is open the thumb grip makes the knife a pleasure to hold and makes gripping very easy. The safety lock works well and feels secure however the red inside of the lock seems a bit cheap and was scratched when it arrived however this is just me being very picky. 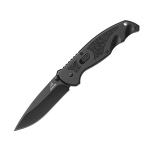 The pocket clip is very secure and has little to no chance of slipping off and also looks great with the SOG logo. One problem however is the difficulty closing the blade once it has been deployed because of the pressure needed to close the lock located on the handle. As far as I am aware SOG will fix this problem if the knife is sent back however living in the UK makes this more difficult for me. Overall I would definitely recommend this EDC from SOG and for the price is a great deal. 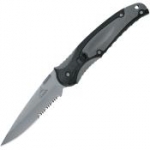 The SOG Flashback Mini is a very good edc option from SOG for 2014. 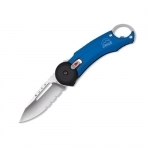 The open-assist is very fast and strong, with a very good pocket clip, handle design, and other features. Very good traction on this knife even though the handle is stainless steel.